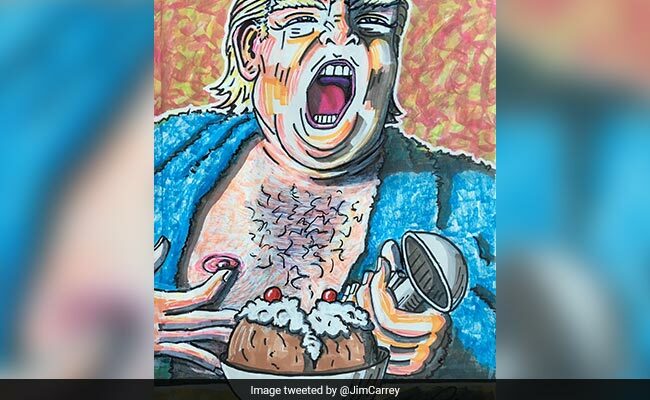 Jim Carrey's portrait of Donald Trump has received mixed responses. American-Canadian actor Jim Carrey has submitted his latest politically-charged portrait of United States President Donald Trump to the Smithsonian National Portrait Gallery for consideration as the official presidential portrait. Washington-based Museum the Smithsonian National Portrait Gallery houses portraits of all former US presidents. "Dear Smithsonian National Portrait Gallery @NPG, I know it's early but I'd like to submit this as the official portrait of our 45th President, Donald J. Trump. It's called, 'You Scream. I Scream. Will We Ever Stop Screaming? '," Carrey tweeted. The image shows Donald Trump in a bathrobe, eating from a bowl containing two scoops of ice cream. The actor's artistic representation has received a mixed response. "Mediocre painting & totally unsuited to the subject. Trump doesn't scream in public (contrary to his opponents) & indeed tends to speak quietly," tweeted one of the users. "Trashy art inspired by a trashy human," a user, who goes by the Twitter handle @youaresoLA, replied. Another user wrote as a reply to portrait, "Whatever happened to respect these days? You don't have to like the man but at least respect the office he holds. @realDonaldTrump @POTUS . I used to be a @JimCarrey fan. What a disappointment." However, Twitterati heaped praises on the portrait as well. "This is art!," tweeted a user called Catherine Goldberg. Another user wrote, "Keep them coming Jim. You on fire boy!" According to reports, Mr Carrey was most recently seen on the big screen in 'The Bad Batch' last summer and in the Netflix documentary 'Jim and Andy', which is now streaming.